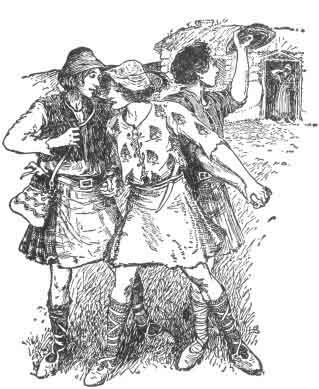 Scottish Fairy and Folk Tales: The Three Green Men of Glen Nevis. THE THREE GREEN MEN OF GLEN NEVIS. four portions and gave a bit to each, putting it in their wallets, and keeping one bit for herself. Then she gave them her blessing, and off they started. they lay very close and still, and did not move till the last trace of her vanished behind the slopes of the Black Mountains. 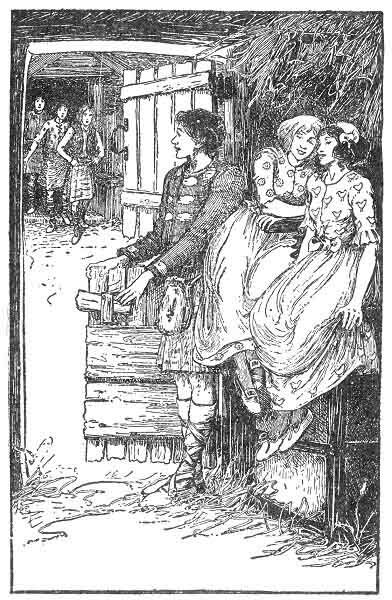 It did not take them long to arrive at the summit where the witch's home was, and where her well can be seen to this day, for they were anxious to get through the business as soon as possible before the, good lady should return, and they were brave lads and had stout hearts for a stiff brae, and fear gave them an extra toe to each foot, as the saying is. Up at the bothie they found all quiet, and they judged the witch had gone for a long journey, for the door was fast locked, and no smoke was to be seen coming out of the chimney. of the Black Mountains; and, looking in that direction, the three brothers saw her, sure enough, coursing over the waste in a direct line with her home, waving her magic staff. 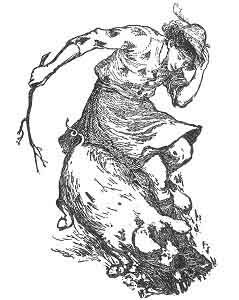 As she strode past the pools, the water splashed upwards in brown foam before her; as she clambered over the peat-hags, the divots and turves flew away on every side; as she swept along the dry paths, the dust in clouds whirled behind her like an attendant spirit. "Quick!" said Duncan. "Get in through the bole in the roof; sit down both of you on the big aschet on the board; garnish your heads with kale, shut your eyes, and don't move or say a word, and all will be well." So Donald and Dougald did as he told them. They crept in through the hole in the roof, and got up on the table, and, sitting down on the big aschet, they decorated their heads with kale and shut their eyes. And Duncan hid behind the large girdle in the corner, holding the cord light in his hand. Thus they waited in silence for what was going to happen. They had not to wait long, for the witch was soon at the door, which sprang open at the touch of her staff, and disclosed the horrid hag entering with upturned and snorting nose, for she had smelt food a long way off, and could not make out whence came the scent. crutch into the corner, took up the knife and fork, and sat down on the chair at the end of the table, ready to enjoy her gruesome supper. But the supper was not for her this time. Just as she was in the act of sitting down, Duncan pulled the cord with a mighty tug, and the chair flew away from under the witch, so that she came down with a mighty crash on the trap-door, which, giving way, suddenly precipitated her backwards into the bubbling water below! "Now for it!" said Duncan; and the brothers, leaping down from the table, seized the large stones that Duncan had placed in readiness along the wall, and flung them down with all their force on to the top of the old hag below. When these were all done, they turned the table over the hole, and heaped on it everything they could lay their hands on. Nothing that they could lift and move came amiss. Then they sat themselves exhausted on the top of the pile to rest and wipe their faces, for it had been a desperate hard job. "No, you don't," said Duncan, leaping down as he saw the magic staff creeping and crawling like a snake towards the door. But the crutch was too sharp for him, and wriggled under the door, and, gliding off, was soon lost among the heather and fern that surrounded the summit of Ben e Bhreac. go and have a leisurely look round about the place to see if there was anything worth carrying off. So Donald searched about the summit to the north, Dougald to the south, and Duncan to the east. There was no use at all in going towards the west, for a precipice went straight down on that side, and it would have been waste of time to have done so. To the north, where Donald went, was what one might call the garden, if such a collection of weeds might be given that name. There Donald went up and down, up and down, yet nothing of the slightest value to himself or any one else did he see, and he felt disgusted at taking all this trouble for nothing. Well, he was just going to give up the search in despair, when he espied a very handsome flower growing beside a rock at the further end, and thought he would go and have a look at it before telling his brothers of his unprofitable search. And the plant was a really pretty one. It had a splendid yellow flower like a great gowan growing on the top of a stout stalk which sprang from a bunch of large green leaves below. He certainly never had seen the like before, and he stood there admiring it very much. "I wonder what sort of plant this can be?" said Donald. "Oh, I'm a Thunder-plant," said the flower. "A Thunder-plant," said the flower again. "Indeed; and what sort of kind can that be?" said Donald. "Just smell me, and you will soon see," said the flower. 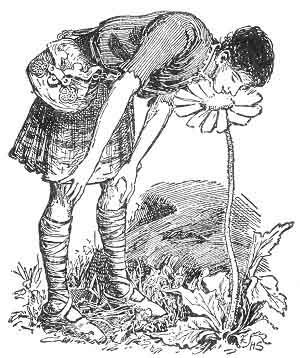 Well, Donald was curious to know what sort of plant a Thunder-flower could be, so he leaned down and gave a truly good sniff in the very centre of the petals. BANG! There was a startling report, and the echoes of it rolled and rolled round the mountains, and Donald fell flat on his back with astonishment and alarm. good companion in a pinch, if you could always do that when you were asked." "I don't object to going with you as a companion," said the flower. "Dig me up carefully, and put me in your wallet. I may be of some use to you on the way." So Donald dug the Thunder-plant up carefully with his knife and put it in his wallet. "At any rate I shall not go home empty. A plant is better than nothing," quoth he; "though of what use a Thunder-plant may be to me I assuredly do not know at present." "Time will show that," said the Thunder-plant. "Ay will it," said Donald. In the meantime Dougald, the second brother, had gone to seek for treasure on the south side of the bothy. Here at first he sought most carefully, but could discover nothing of even the smallest value, and, like Donald, getting tired of seeking, he was almost giving up the hunt in despair, when he heard, or thought he heard, a strange, weird chuckle, like laughter, proceed from behind a heap of rank grass in the shade of the wall. Examining more closely, he discovered the cause of the noise in a queer-looking gray hen, seated amongst the rubbish. 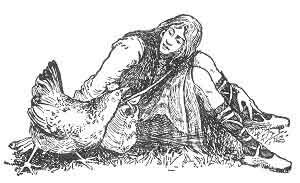 She had a bright red comb and a yellow beak, and from her eyes came such a strange look, unusual in an ordinary fowl, as she fixed them upon the stranger, that Dougald at once understood the bird was something decidedly out of the common. "Dear me," said Dougald, "what sort of fowl are you?" "A Thunder-fowl," said the bird. "I believe I answered loud enough," remarked the bird; "A Thunder-fowl." "Oh, I beg your pardon!" said Dougald; "you did so, but my good mother has kept poultry for many a long year at home, and I have never seen the sort before, and that astonished me." "Put the coop over my head, and leave me in the dark for a short space. Then take it off suddenly, and you will soon find out all about it," said she. Well, Dougald did not like to refuse so civil-spoken a request, especially as it was owing to his curiosity the bird suggested the proceeding. So he put the coop over her head, and counted maybe twenty, and then lifted the coop off again. To say that he was astonished at the terrific crow the fowl emitted is not an adequate expression: he was startled out of his wits. No thunder could produce so mighty a report, or echoes more loud among the mountains, than the sound which came up under his nose when once more the light shone upon the red hackles of the Thunder-fowl, and Dougald fell flat on his back with astonishment and alarm. "What do you think of that?" said the fowl. 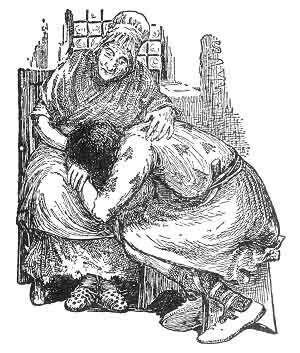 "You don't belie your name," said Dougald, getting up and rubbing his legs and elbows. "Don't do that again without giving me warning. Still, you would not be a bad companion at a pinch, if you could trumpet like that whenever you were asked." "Well, take me with you as a comrade," said the fowl. "It's cold enough and lonely enough living up here, anyway." "I can carry you in my wallet, if you don't mind," said Dougald. "Capital," said the fowl; "only, don't cover my head, or you may be startled when you least expect it." So Dougald put the Thunder-fowl in his wallet, and her head looked out through a hole in the top, and, quite pleased with his discovery, he went to seek his brothers. unpleasant nettles growing, and a pile of sticks set up on end in the corner for fuel. He kicked up some of the nettles, to see if anything was hidden among them, and stamped on the ground in all directions, to hear if it sounded hollow underneath, but nothing did he gain by either performance, and, getting cross, for he did not care to be defeated in anything he undertook, as a last resource before giving it up as a bad job, he poked a long stake into the heap of sticks and rattled it up and down in a very vicious manner. 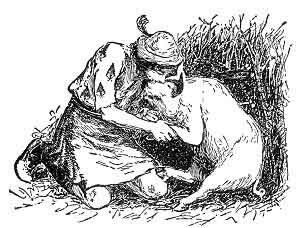 Certes, but he was astonished, when from under the fagots arose a pink, fresh-coloured pig, with beady eyes and a snout as black as ebony. "You must find it a bit cold living upon this hilltop with so miserable a shelter as these sticks," said Duncan. "I'm not a common-bred pig," said the brute. "Would it be rude to ask what breed you are?" said Duncan. "Not at all," replied the pig. "I'm a Thunder-pig, at your service." "What sort of breed is that?" said Duncan. "If you want to know, just kiss me once between the eyes; it will save a lot of explanation." Now, Duncan was not accustomed to kiss swine between the eyes, or anywhere else, for the matter of that, but he thought he had better not decline, as it was his fault that the pig had been disturbed, and one never knows what may be got by being civil to anything, man or beast, and the pig looked clean as pigs go. So he kissed the pig between the eyes. The next moment Duncan felt himself flat on the ground, for such a grunt came from the porker that he fell over backwards from alarm and astonishment at the terrific explosion. And the mountain-tops so long resounded with the report, that you would think the echoes were never going to cease talking about it to one another. "It's lucky you don't produce lightning as well," said Duncan, getting up with a wry face and bruised elbows. "I would rather have you for a friend than a foe any day." "I am quite willing to be the first," said the pig. "For myself, I don't mind if I go with you as a companion; I am rather sick of the life up here." "I, too, shall be glad of your company, and that's a bargain," said Duncan; "and now, let me introduce you to my brothers whom I see coming towards us." So the three brothers met and told their discoveries, and introduced each to the other his new companion; then having nothing more to do at the summit, they descended to the glen below. 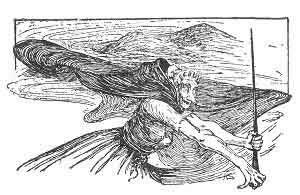 Even to this day there is more thunder round Ben e Bhreac than any of the mountains in the neighbourhood, and when storms are at their loudest round its crags, "Hark," say the good wives of Rannoch; "'Tis the witch of Ben e Bhreac working with her thunder servants." And the mountain is avoided to this day. So, towards the west these three brothers, with their new friends, travelled all that afternoon; and just as they arrived at the head of Glen Nevis, the sun set. So they rested for the night under the shadow of Bennein Beg, since not for all the world would they have ventured to pass through that glen after nightfall fox fear of the three green men who inhabited it, and who were reported savage and fierce to all travellers. in the morning sunshine. This very thing really occurred quite unexpectedly at sunrise, for the wind blowing up the valley flung a corner of the plaid aside, and a beam of light glancing on the red comb of the bird made that creature crow as only it of feathered creatures could crow. THE FOLK PUT THEIR HEADS OUT OF THEIR WINDOWS. bothy windows, and said to one another, "Ha! thunder in a clear sky; strange!" and a good many things, both man and beast, awoke that morning earlier than their usual. But our heroes knew better by this time what it was; and so they arose, and slung their wallets over their backs, and, with the Thunder-pig trotting beside Duncan, they proceeded on their way. But not far had they travelled before the bothy of the first green man met their view rising beside the pathway. A queer building it looked-circular, flat-topped, and without windows; for Trolls and such like can bear but little light. Nothing, in fact, broke the plain appearance of the building but a small, low door, formed of three slabs of stone, one at each side, and one for the lintel, and that not even high enough for the evil creature to creep through without stooping. "Now," said Duncan to Donald, "you go and try your luck with the first green man, while Dougald and I wait here. When you give us a call, or require assistance, we shall be at hand." Donald did not dispute the matter with Duncan, for, though the youngest, he was the cleverest. But I told you that before. So, taking up his wallet, which contained the Thunder-plant, he went to the bothy of the green man and gave a good rap at the door. "There is nobody at home," said the Troll within; "go away." "But it is just that nobody I want to see," said Donald, and he gave the door a kick and crept in. There he saw an ugly Troll, squatting by a turf fire, and that Troll had green eyes and a green plaid mantle cast over his shoulders, and green hair twisted in plaits hung down behind. "That's a very vulgar trick to play in another man's house," said the Troll; "what is your business?" "I am come about a situation," said Donald; "perhaps you may want a servant,"--Page 51. Oh! I am come about a situation: perhaps you may want a servant," said Donald. "No, no, go away," said the Troll; "I have enough to do to find room for myself." "But just listen," said Donald; "I am a first-rate gardener, and could put your kale-patch in order in a jiffy. 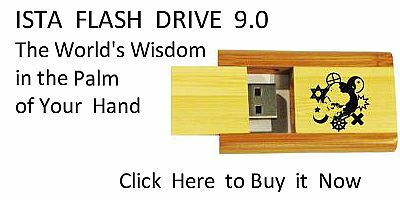 It is desperate untidy, and I am sure it wants tidying badly." "Oh! very well, then, go and dig your fill in the garden," said the Troll, with more urbanity than Donald expected; "go along and dig, go along and delve." The fact was, the Troll was much upset in his mind that morning, and he felt too sick to go on arguing, having heard thunder (which, you know, is fatal to Trolls), and he wanted to get rid of the intruder at any price. He also considered that, as soon as Donald was the other side of the door, he would be able to bolt it within, and if Donald got in again after that, well then, the Troll would be much surprised indeed. As soon as Donald got outside the door, he looked round carefully and quickly, and, when he was sure the Troll was not looking, he swiftly planted the Thunder-plant in the centre of the kale-patch between the bothy and the road. In an instant the Thunder-plant raised its stalk and spread its leaves around, while the blossom at the top unfurled itself like a gigantic gowan. "Oh, do come out, do come out, dear master, and see the lovely flower that has grown in your kale-patch?" said Donald. "Not if I know it," thought the Troll, and he sat silent. But Donald continuing to call out the same thing, the Troll thought he might just as well have a look and see what really was going on. So he peeped through a crack in the side of the door. And astonished he was at the size and beauty of the plant. He could not make out for the life of him how the plant got there; he had not seen it before. Then he thought this must be inquired into, for Trolls, of all creatures, are the most curious, and, knowing nothing, want to understand everything. So the Troll forgot all about the thunderstorm, and opened the door, putting his ugly head through the aperture. "What's the use of that plant?" said the Troll. "Oh! it has the most lovely smell you ever smelt in the world for one thing," said Donald. "Come out and smell it." "Smell it yourself," said the Troll. "I have already done so," said Donald, "and was--oh, so astonished!" Which was anything but a story on his part, you, will readily admit. "Bring the plant here," said the Troll; "for I won't come out for you or any plant." "Oh, then," said Donald, "I shall carry it down the glen somewhere else, if you don't think it worth coming out even to smell it." way. Throwing open the door, he crawled out, waddled up to the Thunder-plant, and took a good long sniff with his ugly snout. Bang! and you know what happened then. 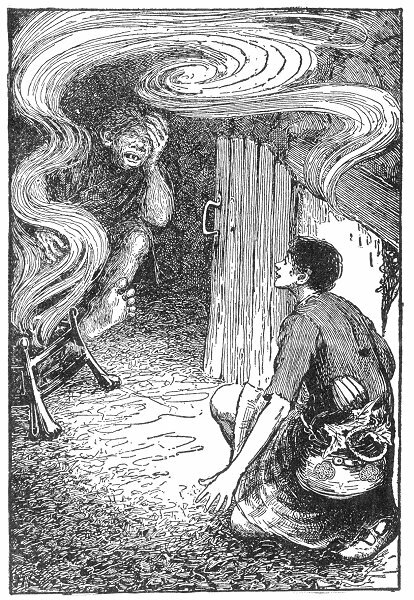 But the Troll, thinking that the thunder was bursting under his very nose, as in truth it was, fled helter-skelter back to his bothy so swiftly, that, forgetting to bob his head on entering the low doorway, he dashed his brains out on the lintel and fell dead on the threshold, and that was the end of him. Then Donald cried out to his brothers, and they came running up, and these three together ransacked the bothy, finding, as they expected, gems and jewels, silver and gold, hidden in the four corners, besides a lump of fiery-coloured crystal above price, stowed away below the hearthstone. "Now, Donald, do you stay here," said Duncan. "Keep what you have fairly earned, while I and Dougald go a bit further on and try our luck with the other two green men of the glen." So Donald stopped behind and waved a farewell to his two brothers as they went down the valley under the shade of Ben Nevis. And it was not long before they saw a round tower like the first, built in the middle of the glen close to the roadside. "That's the bothy of the second green man," said Duncan. "Go you, Dougald, and try your luck. I will wait for you here with the Thunder-pig till I hear you call out." So off Dougald went with the Thunder-fowl looking out of his wallet. "Is any one within?" said Dougald, rapping with his stick at the little, low door. "No," said a harsh voice, which he knew was the Troll's; "go about your business." "A word with you first," said Dougald. "That word will be your last, then," said the Troll, "if you don't move on." "Flatly, I won't move on," said Dougald; "I must and will speak to you!" "In the name of all that's ugly, tell your business, then!" said the Troll, opening the door and showing his hideous green face to Dougald. "Well," said Dougald, "I am a master cook, and cook broth out of nothing; and I am on the lookout for a situation." Now the Troll considered for a moment. He had not had a good meal for a day or two, owing to the thundery weather, especially to the violent reports heard both yesterday and that very morning, and being unable to go out and procure food, and feeling really very hungry, the thought of broth made his chops water. "Besides," said he, "what need have I to be afraid of this intruder? If he fails in his cooking me the broth, it won't take long to destroy him and stew him into broth instead." on the threshold to sharpen it and to give point to his words. "Oh! you'll find it savoury enough to last for a long time," said Dougald. "Give me that kale-pot with the cover on it that I see lying behind the door." PUT THE FOWL INTO IT INSTEAD. on, and Dougald carried it outside, as if to fill it with water at the burn. But when he was below the bank, out of sight of the Troll, he deftly put the Thunder-fowl into it instead, and shut down the lid. Then he brought the pot back again to the bothy, and placed it on the ground before the Troll. till I count twenty, then lift up the lid and see what sort of broth I can cook. Take my word for it, my friend, you will never want to taste any other after that." 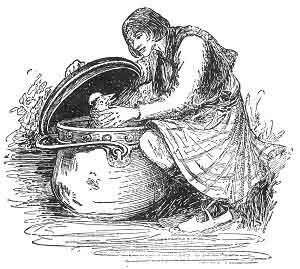 "Oon, da, tre, cahir," counted Dougald, and scarcely had he got to the word "fichead" when the impatient Troll flung aside the lid, and, plunging the iron spoon into the pot, stirred up the Thunder-fowl that was sitting quietly at the bottom. And the light from the chimney above smote suddenly on the red comb of the Thunder-fowl, and she gave such a crow that the walls of the bothy shook as if it were stricken with a thunderbolt. 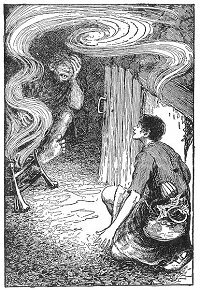 Then up leaped the Troll, and fled shrieking with dismay towards the door, for he thought the fire had come through the roof; but so full of terror was he, that he quite forgot to bob his head, and so, dashing out his brains on the lintel, he lay dead and still on the threshold, and that was the end of him. Then Dougald called out to his brother Duncan, who was keeping watch as he had promised, a short way up the road, and Duncan and the Thunder-pig came up to his call as quick as they could. Indeed, it was not long before they had unearthed the Troll's treasure--gems and jewels, silver and gold, hidden in the four corners of the bothy, and a large slab of golden topaz, worth a king's ransom, stowed away under the hearthstone. return--I hope with treasure,--then we will pick up Donald and go home together." DUNCAN AND THE THUNDER-PIG CAME AS QUICKLY AS THEY COULD. green man's bothy, and Duncan and the Thunder-pig went on alone down the glen towards the sea. bothy exactly like the last, enclosed within a dyke of loose stones. There was no sign of life about it, and it looked so particularly forbidding, that Duncan determined to have a good look round, and inspect the place from every side, before he knocked at the door. Getting over the dyke he crept quietly round the back of the bothy, and there, on a level with his head, he saw a window, just big enough to crawl in or out of, filled with wattles twisted up and across like bars. "This will be of some use, I feel sure," said Duncan; and he then asked the Thunder-pig to be so good as to lie down under the window and to wait till he called. Oh! the Thunder-pig was quite agreeable to do so. Having settled that, Duncan went to the little door in front, and knocked and knocked, but no sign or answer came from within. But he felt sure the green man must be at home, for Trolls never steal abroad in the daytime, but love the dark gloaming and night alone. "This Troll must be either deaf or very uncivil," said Duncan; and so saying, he took a short run and gave the door such a fierce kick that he sent it crashing inwards, bolts and fastenings flying into the middle of the chamber. "How dare you intrude in my bothy, you good-for-nothing scamp, you?" said the Troll; for, of course, as soon as he saw there was no further use of concealment, the ill-omened creature emerged from behind a heap of turf in the corner. "How dare you kick my furniture about in that way? Where are your manners? I tell you, if your parents ever taught you any, they taught you them upside down." "Oh!" said Duncan, putting on an air of complete composure, "I heard you were a bit lonely, and so I came in to call on you in a friendly sort of way in passing." "Who told you I was lonely? I'm not lonely, d'ye hear?" screamed the Troll: "I'm not lonely! and I don't care if she never comes back again!" "Oho!" thought Duncan. "She never comes back again? There's a she in it. I'm on the scent of something." So he said as a shot: "Oh! then she has not come back yet. That's very curious?" "Hush! hush!" said the Troll, putting out both his hands as if to hide some horrible vision. "I see you know all about it. No, she has not come back; but I am desperately afraid she will. Look what she did this morning," said he, pointing to the broken furniture and crockery that strewed the floor. For you must know the Troll had that day had a fierce and fearful quarrel with his spouse, which ended in his turning her out into the road, and she had marched off fuming, and threatening to return in a very short time with her brother, a more powerful Troll, and so be avenged. "That accounts for the hubbub I heard a short while ago up the glen," said Duncan. "I have no doubt at all she is coming back very shortly." "Oh! now, don't you say that; it is too horrible! What shall I do? what do you advise me to do?" said the Troll; for by this time he was thoroughly frightened. "You don't know what a nasty, spiteful, revengeful thing my wife is." "Well," said Duncan, laughing to himself at how the simple Troll let out his secret. "I'll tell you what to do in the first place. I would put the house a bit in order and remove all signs of the quarrel. You do this room up, and I will make that little chamber yonder tidy, for I am a good hand as a house servant, and then, don't you see, when your wife comes back to pay you out for this morning's work, you can easily say she must have dreamt it all." "Capital!" said the Troll, much relieved; "you shall have a nice reward if I succeed in this." But the evil thing only wanted an opportunity to give him a smack on the head as soon as he had the chance, you may rely on it. 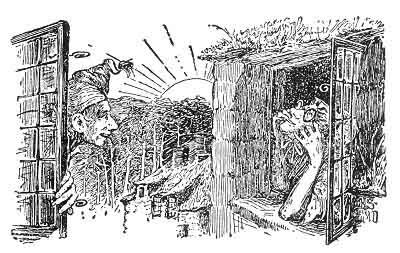 So Duncan went to the recess in the wall where the little window was, and where he saw the Troll-wife's bed lying in an untidy heap on the ground, and while the old Troll was busily engaged in redding up the large chamber, he whistled softly to the Thunder-pig outside. 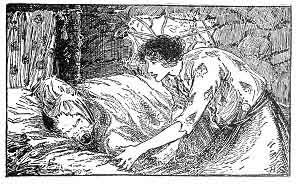 It came to the window, and lifting it in through the wattles, he made it lie down in the bedclothes. nightcap. He then bade the Thunder-pig lie still, and not move till he got the word. "Oh my!" cried Duncan, coming into the middle chamber; "here's a fine thing happened! There's something strange asleep in the bed; it must surely be your wife come back unknown to you." "Good life!" said the Troll, sitting down with a plump on the hard floor; "you don't say so!" "But I do say so," said Duncan. "Whatever am I to do?" said the Troll. "Come, you won't mind putting on my clothes and pretending to be me for a bit while I hide. Yes, do; I'll make it worth your while, and she will be that terrible when she wakes; oh, I think I shall have a fit!" between her eyes. Take my word for it, you won't hear any more on the subject." "Think so?" said the Troll. "I'm not so sure; she's so revengeful." "Think so?" said Duncan. "I say so; I'll stake my life on it if it don't succeed, or if you have another row with your wife after you have done so, I'll tell you what, I promise to marry her myself." And Duncan laughed to himself to think what a real, honest truth he was speaking. "Done with you!" said the Troll, as he crept carefully on tiptoe to the recess over there. Sure enough, he saw something pink, with closed eyes, snoring in his wife's bed. So without more ado or further investigation, for now he was alarmed to think his wife might wake up before he gave her the peace-making caress, he bent over the sleeping figure and gave it a good sound kiss between the eyes. "Wake up, my lass, wake up!" said the Troll in a cheery voice. Wake up? indeed, it was wake up! Had the thunder got into his wife's inside? Bang, bang, bang! It took but two steps for the Troll to cross the floor of his bothy in his rush for the door, where, forgetting just like the other two to bob his head, so great was his anxiety to leave the place, he dashed his brains out against the lintel and fell dead, crumpled up in an ugly mass on the threshold, and that was, the end of him. where to look for it. In the four corners of the bothy were hidden gems and jewels, silver and gold, while, stowed away under the hearthstone, he found three bags of pearls, shining so clear and clean, they must have come from the mussel-beds of Leven, so pure were they. So he filled his wallet and his pockets with the treasure, and, whistling to the Thunder-pig, he marched up the glen to where his brother Dougald was waiting for him at the bothy of the second green man, and, finding him, they passed on together to the bothy of the first green man, where the eldest, Donald, expected them. Then with mutual congratulations, and in cheerful companionship, they all went up the glen homewards to Rannoch, and on the way Duncan could not help boasting of how cleverly he had managed the whole proceedings in this way and that way. And the two elder brothers did not contradict him, because, though Duncan was the youngest, he was so much the cleverest, and so--oh, but I beg your pardon! I have told you all that before. Oh but they were glad when they saw once more the fair loch of Rannoch shining in the evening run, and looked again upon the clachan, and the bothies of their old friends at home, and beard the robins singing in the fir-trees. There, too, they saw their old mother bringing in the washing she had hung out to dry on the rowan-bushes, for it had been a fine summer day after the thunderstorm, and the west wind blew softly. She was surprised, you may be sure, to see them so soon returning with such queer companions and such full pouches. And they all three kissed her, and she kissed them, bidding them each a hearty welcome home. So they told their tale, and showed her all their treasures, and they blessed themselves that they never need leave dear Rannoch and home again. Well, what? you won't be satisfied till you hear what happened to the Thunder-creatures? Oh, ah! yes, I forget to tell you that. 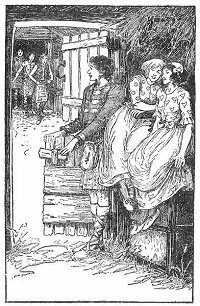 The very--next morning, when Duncan and his brothers went to the byre behind the bothy where they had lodged their companions for the night, what was their surprise to see a handsome young man, clad in tartan, standing by the door, and two fair maidens seated by him on the cheese-press. "Your servant, sir," said the young man. "May I introduce myself as MacSwiney of Glen Muick, and these are my two sisters, Flora and Foula, both of whom you remember, I am sure, as the Thunder-plant and Thunder-fowl. I, I need hardly add, am the Thunder-pig, at your service. We were enchanted by the witch of Ben e Bhreac, from which thraldom you have released us, for which receive our thanks." Having said this, the young man bowed again, and his sisters got up and curtsied their acknowledgments. The next morning Duncan and his brothers found a handsome young man standing by the door and two fair maidens seated by him.--Page 64.
up to Foula, and begged them to remain and be their wives, and both Flora and Foula said, "Thank you kindly; we will." HID HIS FACE IN HER APRON. by his mother, hid his face in her apron, and refused to say a word to anybody. had got none, for all his cleverness. But he looked so very unhappy about it, that MacSwiney came up to him and said, "Cheer up; I have a sister at home as beautiful as Flora or Foula. I will send for her, and she will make you a good wife, and you will be as happy as the others." So it came to pass; and they were all married on the same day, MacSwiney giving his sisters away; and the wedding feast was a splendid one, for had not they the Trolls' treasure to buy provisions with? One thing I do hope,--that the brides and their brother forgot their old tricks of thunder-making, nor played any such games on the wedding guests. I am certain it would have disturbed much the whole proceedings. I know for one, I should have felt, like the Trolls, most uncomfortable.